Handmade Bend is the brainchild of photographer Kim Tallent and ceramic artist Michael Knapek. Together, they have built a business that creates functional, beautiful artwork designed to be used in people’s everyday lives. 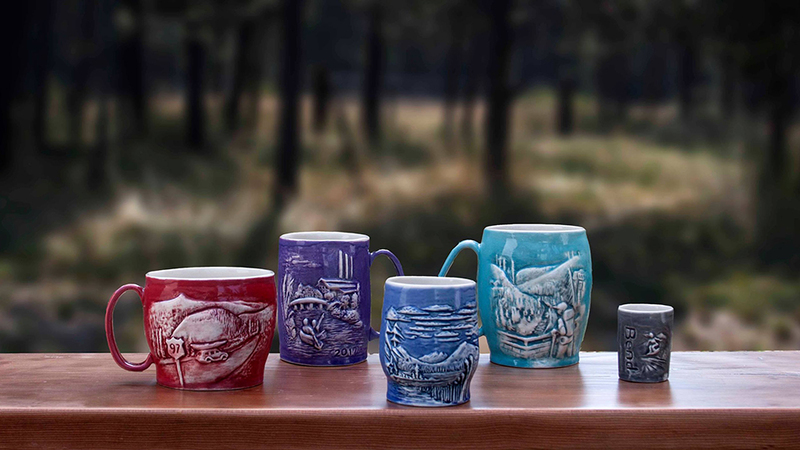 Vases, candle holders, mugs, even shot glasses depict the scenery and lifestyle that is unique to Central Oregon. The process of creating these pieces is unique as well. First, the clay is formed into the desired shape, the scene is sculpted, and the final artwork is cast in plaster. Then, the mold is filled with liquid, lead-free clay, the excess is poured off, and after the piece is hardened and unmolded it is fired, glazed, and fired again, producing a glass-like finish in brilliant colors. The end result is stunning works of art with mountain scenes, waterfalls, bikers, and paddlers cast in sharp relief and incredible detail. Handmade Bend items are sold in select stores in Bend, at festivals and art shows throughout the region, and on the company’s web site. Every piece is one of a kind, and every design is inspired by the people, towns and natural beauty of Oregon.